Products that are transported for a longer period of time or stored for an extended period are often in need of corrosion protection. Corrosion protection packaging prevents corrosion without having to treat the metal with oil, grease or paint. Corrosion is a significant problem in the handling, storage and shipping of products. Bare metal parts corrode easily. Temperature changes, contaminated air, sea salt and moisture, all create corrosion. Due to temporary corrosion, time is diverted to handling complaints and customer loyalty is potentially lost. Delayed deliveries due to reworking of corroded components translate to avoidable losses. Therefore, planning for corrosion protection during temporary storage and transportation is a logical strategy to minimize these losses. There are several different solutions for protecting the product from corrosion depending on parameters such as: product type, means of transportation, and the length of the transit time. 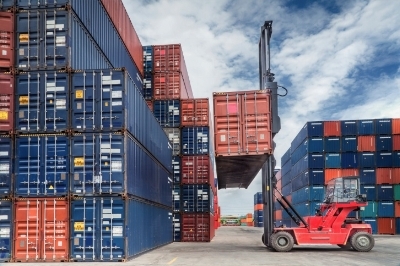 There are many industrial applications where temporary corrosion protection during transit and storage is critical for the final processing and end use of parts and components. If semi-finished or machined components are left unprotected, or roller bearings are not coated with a rust inhibitor during storage, or internal combustion engines are transported and stored without corrosion prevention, then they may deteriorate or become damaged due to corrosion. Any subsequent rust removal will not restore a component to its original quality and geometrical accuracy. Permanent corrosion protection cannot be used for temporary applications because it must be removed before further processing or assembly. Because corrosion can appear within hours or days a temporary corrosion prevention method must be implemented. During transportation and storage, fasteners (e.g., wedges, springs, bolts, nuts, washers, screws) and associated tools require protection from corrosive chemical reactions on their surfaces. Desiccants to control air humidity are used to prevent corrosive deterioration during storage and transport. Silica gels and molecular sieves are occasionally used as desiccants to absorb excess air moisture. Sealed films of high pressure polyethylene and special waterproof and airproof packaging systems are used for critical applications. Allowing temporary corrosion and rust on materials during interstage processes and transportation is costly due to the direct and indirect costs involved in rework and warranty damages. When carefully chosen, preventive solutions are cost effective for both application and subsequent removal. For confined spaces, authorized specialists must be consulted. Ensure compliance with personal protective equipment (PPE) and firefighting regulations. The combustion products of coatings can be highly toxic. Hence exposure control must be planned for in advance. Precautions should be taken to avoid eye contact and skin exposure with proper PPE suitable for the application method used. Respiratory protection might be needed in a few cases. 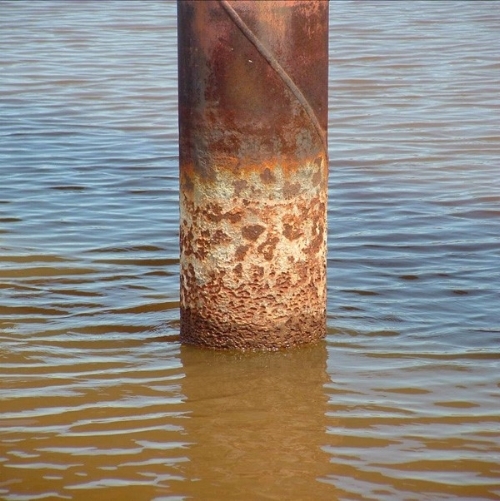 Conventional corrosion is an electrochemical redox reaction, thus when steel is in contact with an electrolyte and oxygen, then steel mass will be lost, this is more pronounce in sea water. Corrosion, compared to time is generally a linear process and is uniformly spread over the exposed area. On the basis of this table the common method utilised in accounting for corrosion is to utilise a sacrificial thickness by increasing the thickness of the pile by at least 4mm. However, for construction in the Arabian gulf this method may not be the optimal solution due to the climatic and seawater conditions. The gulf coastline experiences some of the most extreme weather conditions with summer temperature reaching up to mid to high forties, with the salinity of the Gulf generally being highly variable with some sections near the coast reaching a concentration of 10 % (Fookes et al). In general, the salinity of the Gulf, at 4 %, is also higher than the open ocean, at 3 %. The sacrificial thickness specification for a pile in sea water in zone of high attack is 3.75 mm, which means that a corrosion rate of 0.075 mm/year is adopted. However, according to research presented in CIRIA C634 that is the minimum rate of corrosion reported. The average corrosion rates reported range from 0.08 to 0.2 mm/side/year. For the harsh aggressive environment of the Arabian Gulf compounded with high and variable salinity of sea water, with the high temperatures a higher corrosion rate in design is recommended for optimal durability. The highest corrosion rates range from 0.17 to 0.34 mm/side/year. For a worst-case scenario, the highest corrosion rate will see a loss of 17 mm of steel, and if a sacrificial thickness of 4 mm is utilised, it will only protect the integrity of the member for 12 years.